Join our book clubs! You are welcome to join anytime! Any questions? Call 221-6740. Typically, meetings are on the 1st Wednesday of the month at 6:15 PM at the Harmony Library. If you are in a book club, and would be willing to share your booklist with us, please drop a copy off at the Reference desk at the Library. The Library Book Club Coordinator will tailor a presentation to meet your group's needs. Call the Library at 221-6740 to get more information or schedule a meeting with Currie Meyer, Book Club Coordinator. 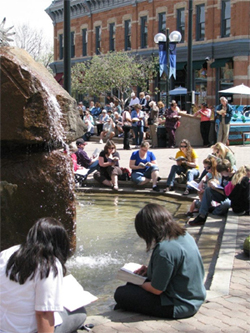 Sponsored by the Poudre River Public Library District & Harmony Library, a joint-use library of the Front Range Community College, and the Poudre River Public Library District. The Poudre River Public Library District will make reasonable accomodations for access to District services, programs, and activities and will make special Communication arrangements for persons with disabilities. Please call (970) 221-6740 for assistance.